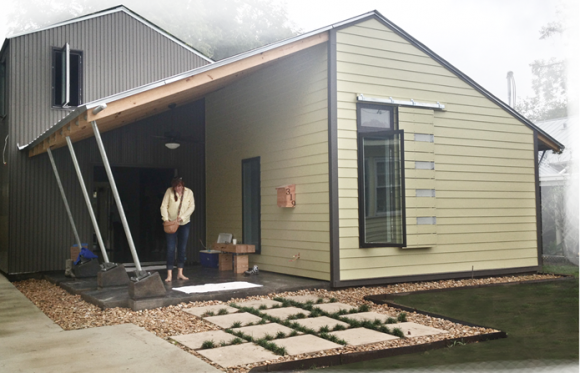 The NEXThouse was made possible through LPTFA’s continued financial support of ULL Building Institute to construct urban, green, infill homes in Lafayette. 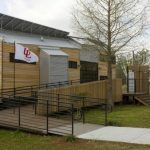 The NEXThouse, which is part of the ULL Neighborhood Infill Program, is located at 319 Jackson Street, Lafayette, Louisiana in the Freetown/Port Rico neighborhood. The home has an open concept with 1,300 square feet of living space with another 400 square feet of covered porches. The spacious kitchen comes with Energy Star Appliances. The split floor plans has 2 bedrooms (Master Bedroom = 15’6″ x 11’7″; Second Bedroom = 11’6″ x 10’7″), 2 bathrooms, and a loft (11’6″ x 17’3″). Exterior materials of hardiplank cement siding and corrugated metal siding are low maintenance. 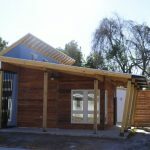 The structure is advanced 2 x 6 framing with polyurethane foam insulation. The home comes with a highly-efficient 16 SEER heat pump AC, instantaneous electric water heater, and 690 W photovoltaic solar array with micro-inverters which allows it to be expanded up to 3kW.